Raising of our little adorable darling: My New Hair Style! It is really tough to make distinct from Thamizhini's hair and Coconut oil, when my mom is here with us. She did the same when I was kid. Oh! no, Not only when I was kid, till I completed my 12 std. :D Yeah, for Thamizhini also she does the same, applies oil as the first duty when she come out from bed and again once in the evening before she goes to play. And even sometimes in the afternoon too! Kai -le ellma oil ayiduche! I used to make fun my mom telling that, we can make Poori from Thamizhini's head only. 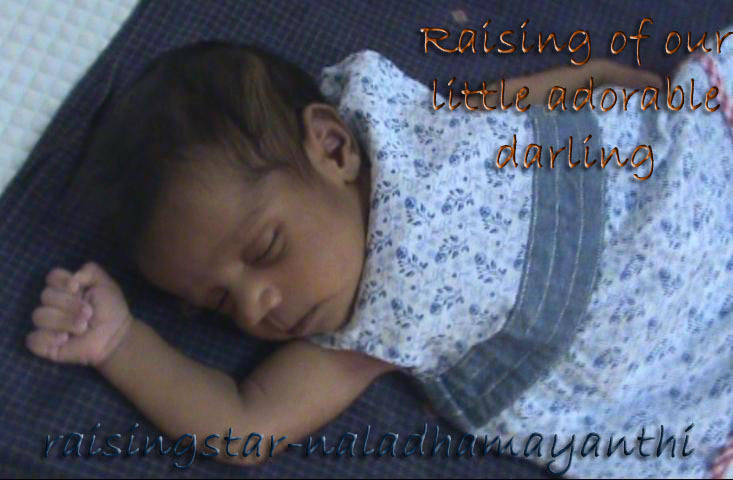 My mom was here for a month and really I could see the difference in Thamizhini's hair. Yeah, to everyone's surprise, her hair grown to few inches. so now, me also started like my mother, applying oil 3 times daily, morning when she gets up, afternoon when I come for lunch and in the night by 7, before / after her bath. As summer started, even I don't like to give a chance for her hair to go dry. So what else, after applying oil to her. Comb it. Yeah, Comb her hair. She really does not like to comb her hair. We have 2 combs for her, but whenever we take that, she just asks / cries for them. Then she starts combing her hair, sometimes she goes to in front of the big mirror and combs, as we do. Is this called Spikes? tell me anyone. Amma is making me more funnier. Ok, however, I realized the importance of oil to baby. If I keep my hand over her head, I could feel the heat coming out from her head. Her body is always very heat and to manage at least to some degree, I give oil bath thrice per week and these days I give her daily head bath. Oh! Hair fall? No chance...!!! Oil is very good for hair but to some extent (Especially for kids. Few may develop cold). As long as she is not getting cold/fever , you can giver her head bath daily . For Chennai Summer - Oil bath is needed!! !